What IS the point? I mean when you have an addiction and mental illness that basically rule and discipline your life then what is the point? You’re an addict to your ways. You can’t escape the habit, the inferno in your heart that you have to do what you do everyday. Does that make sense? Then you have an illness that isn’t visible so no one can see or hear your pain. You try to heal the pain by FDA approved medication but that just gives you more hell. Like being a zombie all the damn time. Not even being able to thing. Losing your damn hair. Just wanting darkness and hating the light. Your skin blisters in the sun or peals non stop. You need energy but yet can’t get it because the medicine is made to bring you so far down you don’t compromise your life. Not to mention the people in your life don’t get how extreme this silent illness is. They just ignore it. They just act like it doesn’t exist. They just act like you don’t exist. So I ask again, what is the point? The point is…the sun, the moon, books, smiles, crying, anxiety, the smile from my 12 year old because she knows how smart she is, the laugh of my 8 year old because he thinks he said something funny, having great sushi, reading even though you feel guilty. But yet…I have an addiction to alcohol…coupled with a mental illness. I’m having a hard time finding freedom and happiness. Once again, I’ve found the black hole. When I was little my oldest brother and I used to annoy the heck out of my Dad by calling him Pops, it made him feel old and he hated it. When my daughter began to talk, I taught her that his name was Pops just for a little bit of annoyance (funny annoyance, not pissy) and he took right to it. He said my children can call him anything as long as they call him. So now he’s Pops and loves the name. Anyway, I want to let everyone know that drinking to excess can kill your heart. Alcoholism doesn’t just strike at your liver, it can kill every organ in your body, including your brain. We mostly refer to alcoholism as killing your liver because cancer of the liver is the most common illness associated with alcoholism. There is no rhyme or reason to how alcoholism effects our body, this killer disease doesn’t just want to be your drinking buddy, it wants to kill you and if given enough strength; it will kill you. * Uncomfortable pressure, squeezing, fullness or pain in the center of the chest that last more than a few minutes or goes away and comes back. * Pain or discomfort in one or both arms, the back, neck, jaw or stomach. * Other signs such as breaking out in a cold sweat, nausea or lightheadedness. List compiled by the AHA and can be found on there website. I am in no way shape or form have a PhD and I certainly do not play a doctor on TV, so please if in doubt talk with a doctor as soon as possible. If you are an alcoholic or just “think” you have a drinking problem I can direct you to help if you would like it, just shoot me a comment and I’ll get back with you ASAP. And I also need to make a note here, that names (atleast mine and my family’s) are anonymous so if you do go to the Hoops for Heart Donation page and decide to post here, please do not use my daughter’s real name…on this blog we refer to her as Smarts. 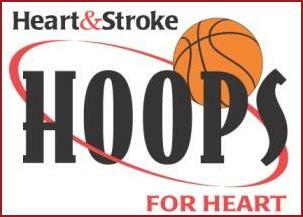 You can get to her page by clicking on the Hoops For Heart image in my sidebar or by clicking here.